In 1841 Edgar Allan Poe wrote this short story, based in the raging waters that surround the Lofoten Islands in the Arctic Circle of Norway. Two brothers, fishermen, are caught in fog and stray into the swirling tumult that is the maelstrom called Moskenesstraumen, the world’s fastest moving current of water. The boat is sucked down. One brother ties himself to the vessel and is dragged to his death. The other brother clings to a barrel, rises to the surface and survives. In 1980 Philip Glass composed a 66-minute piece based on the short story. It was played once, in Australia, as the accompaniment to a dance performance. In 1981 the 6-man Philip Glass Ensemble recorded the piece for posterity. 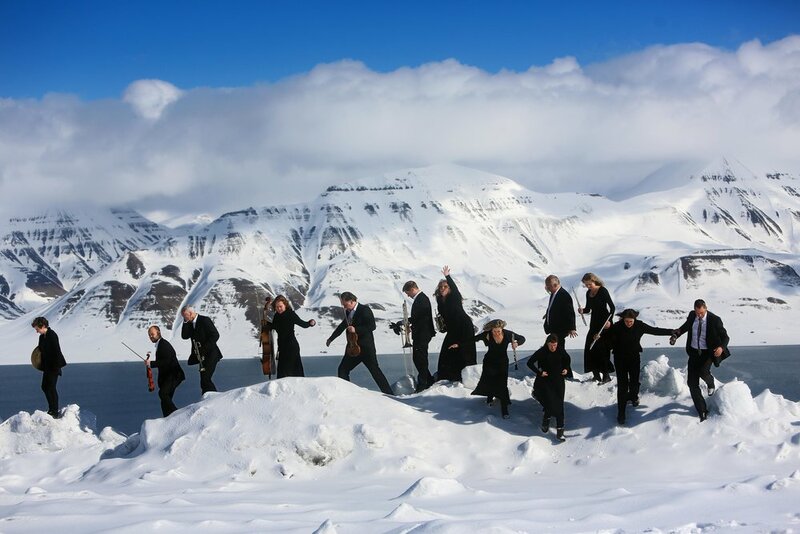 In the summer of 2018 the 60 strong Arctic Philharmonic Orchestra and choir will perform the piece in its birthplace, on the top of a mountain overlooking the Moskenesstraumen. musicians will be transported to the remote island of Skrova and will climb the mountain that stands there, dressed in tuxedoes and carrying their instruments. Juxtaposed with the rehearsals, the scaling of the mountain and the concert will be documentation of the lives of the workers of Lofoten. Small humans doing their best to carve out a life in a vast and inhospitable landscape, and succeeding at it. We will portray the sheepherder who tends her flock on the remote islands of Røst. The line repairmen who mend broken power lines under the eerie green light of the aurora borealis. Evy the fisherwoman who takes her small wooden trawler out to the fishing banks for the yearly cod fishing. The driver of a snowplough clears the roads in a huge cloud of white spray. The crew of the Sea King helicopter as they rush to rescue a sinking fishing boat. A birthing woman is rushed to hospital in a lifeboat, the only vessel that can move in the winter storms. At a remote churchyard on a cliff top, an old man is laid to rest. A fighter pilot takes off from the airport at Bodø and flies through the mountains and valleys of the islands, twisting, diving and turning at breakneck speed. We descend under water to the wreck of an old fishing boat. A man hangs cod to be made into stockfish on to cathedral-like drying racks. At the climax of the film, as the orchestra plays the last bars of Descent into the Maelstrom, all the people we have met in the course of the film will also have ascended the mountain and assembled on top, to mingle and laugh with the musicians. The entire film is without dialogue; the music of Philip Glass will play undisturbed. institutions. The orchestra presents 140-150 performances and concerts each year, with the orchestra’s musicians switching between different ensemble formats on a regular basis. The orchestra holds regular concerts in our two cities, Bodø and Tromsø, but our home base comprises the entire Northern Norway and the High North. the world, and continues to appear regularly with the Philip Glass Ensemble. mystery and horror gave birth to the modern detective story and many of his works became literary classics. 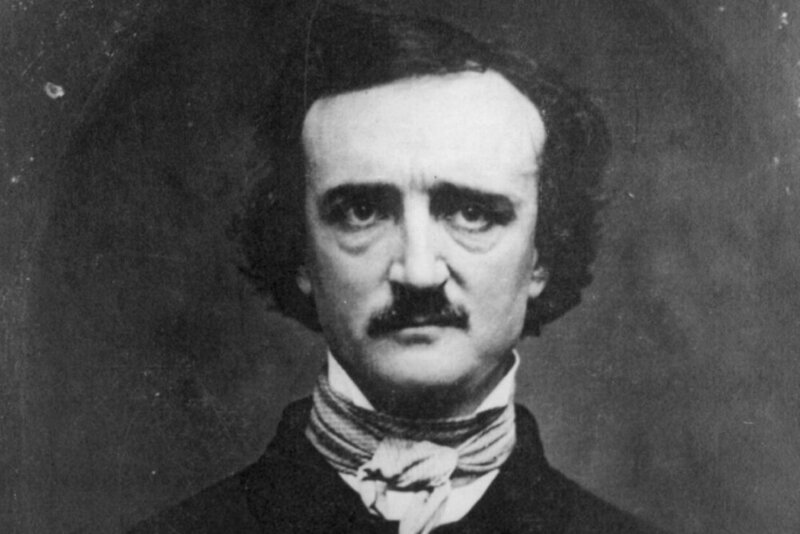 ”The Raven,” which he published in 1845, is considered among the best-known poems in American literature. ”Father of the Detective Story.” Some aspects of his life, like his literature, is shrouded in mystery, and the lines between fact and fiction have been blurred substantially since his death. "So it is sometimes termed," said he. "We Norwegians call it the Moskoestrøm, from the island of Moskoe in the midway." In regard to the depth of the water, I could not see how this could have been ascertained at all in the immediate vicinity of the vortex. The "forty fathoms" must have reference only to portions of the channel close upon the shore either of Moskoe or Lofoden. The depth in the centre of the Moskoestrøm must be immeasurably greater ; and no better proof of this fact is necessary than can be obtained from even the sidelong glance into the abyss of the whirl which may be had from the highest crag of Helseggen. Looking down from this pinnacle upon the howling Phlegethon below, I could not help smiling at the simplicity with which the honest Jonas Ramus records, as a matter difficult of belief, the anecdotes of the whales and the bears; for it appeared to me, in fact, a self-evident thing, that the largest ship of the line in existence, coming within the influence of that deadly attraction, could resist it as little as a feather the hurricane, and must disappear bodily and at once. "You have had a good look at the whirl now," said the old man, "and if you will creep round this crag, so as to get in its lee, and deaden the roar of the water, I will tell you a story that will convince you I ought to know something of the Moskoe-strøm." "We kept the smack in a cove about five miles higher up the coast than this ; and it was our practice, in fine weather, to take advantage of the fifteen minutes' slack to push across the main channel of the Moskoe-strøm, far above the pool, and then drop down upon anchorage somewhere near Otterholm, or Sandflesen, where the eddies are not so violent as elsewhere. Here we used to remain until nearly time for slack-water again, when we weighed and made for home. We never set out upon this expedition without a steady side wind for going and coming -- one that we felt sure would not fail us before our return -- and we seldom made a mis-calculation upon this point. Twice, during six years, we were forced to stay all night at anchor on account of a dead calm, which is a rare thing indeed just about here ; and once we had to remain on the grounds nearly a week, starving to death, owing to a gale which blew up shortly after our arrival, and made the channel too boisterous to be thought of. Upon this occasion we should have been driven out to sea in spite of everything, (for the whirlpools threw us round and round so violently, that, at length, we fouled our anchor and dragged it) if it had not been that we drifted into one of the innumerable cross currents -- here to-day and gone to-morrow -- which drove us under the lee of Flimen, where, by good luck, we brought up. "I could not tell you the twentieth part of the difficulties we encountered 'on the grounds' -- it is a bad spot to be in, even in good weather -- but we made shift always to run the gauntlet of the Moskoe-strøm itself without accident ; although at times my heart has been in my mouth when we happened to be a minute or so behind or before the slack. The wind sometimes was not as strong as we thought it at starting, and then we made rather less way than we could wish, while the current rendered the smack unmanageable. My eldest brother had a son eighteen years old, and I had two stout boys of my own. These would have been of great assistance at such times, in using the sweeps, as well as afterward in fishing -- but, somehow, although we ran the risk ourselves, we had not the heart to let the young ones get into the danger -- for, after all is said and done, it was a horrible danger, and that is the truth. "Our boat was the lightest feather of a thing that ever sat upon water. It had a complete flush deck, with only a small hatch near the bow, and this hatch it had always been our custom to batten down when about to cross the Strøm, by way of precaution against the chopping seas. But for this circumstance we should have foundered at once -- for we lay entirely buried for some moments. How my elder brother escaped destruction I cannot say, for I never had an opportunity of ascertaining. For my part, as soon as I had let the foresail run, I threw myself flat on deck, with my feet against the narrow gunwale of the bow, and with my hands grasping a ring-bolt near the foot of the fore-mast. It was mere instinct that prompted me to do this -- which was undoubtedly the very best thing I could have done -- for I was too much flurried to think. "At first I could not make out what he meant -- but soon a hideous thought flashed upon me. I dragged my watch from its fob. It was not going. I glanced at its face by the moonlight, and then burst into tears as I flung it far away into the ocean. It had run down at seven o'clock! We were behind the time of the slack, and the whirl of the Strøm was in full fury! "When a boat is well built, properly trimmed, and not deep laden, the waves in a strong gale, when she is going large, seem always to slip from beneath her -- which appears very strange to a landsman -- and this is what is called riding, in sea phrase. Well, so far we had ridden the swells very cleverly ; but presently a gigantic sea happened to take us right under the counter, and bore us with it as it rose -- up -- up -- as if into the sky. I would not have believed that any wave could rise so high. And then down we came with a sweep, a slide, and a plunge, that made me feel sick and dizzy, as if I was falling from some lofty mountain-top in a dream. But while we were up I had thrown a quick glance around -- and that one glance was all sufficient. I saw our exact position in an instant. The Moskoe-Strøm whirlpool was about a quarter of a mile dead ahead -- but no more like the every-day Moskoe-Strøm, than the whirl as you now see it is like a mill-race. If I had not known where we were, and what we had to expect, I should not have recognised the place at all. As it was, I involuntarily closed my eyes in horror. The lids clenched themselves together as if in a spasm. "The result was precisely what I had hoped it might be. As it is myself who now tell you this tale -- as you see that I did escape -- and as you are already in possession of the mode in which this escape was effected, and must therefore anticipate all that I have farther to say -- I will bring my story quickly to conclusion. It might have been an hour, or thereabout, after my quitting the smack, when, having descended to a vast distance beneath me, it made three or four wild gyrations in rapid succession, and, bearing my loved brother with it, plunged headlong, at once and forever, into the chaos of foam below. The barrel to which I was attached sunk very little farther than half the distance between the bottom of the gulf and the spot at which I leaped overboard, before a great change took place in the character of the whirlpool. The slope of the sides of the vast funnel became momently less and less steep. The gyrations of the whirl grew, gradually, less and less violent. By degrees, the froth and the rainbow disappeared, and the bottom of the gulf seemed slowly to uprise. The sky was clear, the winds had gone down, and the full moon was setting radiantly in the west, when I found myself on the surface of the ocean, in full view of the shores of Lofoden, and above the spot where the pool of the Moskoe-strøm had been. It was the hour of the slack -- but the sea still heaved in mountainous waves from the effects of the hurricane. I was borne violently into the channel of the Str�m, and in a few minutes was hurried down the coast into the 'grounds' of the fishermen. A boat picked me up -- exhausted from fatigue -- and (now that the danger was removed) speechless from the memory of its horror. Those who drew me on board were my old mates and daily companions -- but they knew me no more than they would have known a traveller from the spirit-land. My hair which had been raven-black the day before, was as white as you see it now. They say too that the whole expression of my countenance had changed. I told them my story -- they did not believe it. I now tell it to you -- and I can scarcely expect you to put more faith in it than did the merry fishermen of Lofoden."